Bakery is an up-at-dawn six days a week business but thankfully we're natural early-risers, no pun intended! As down-to-earth, country-lovers we like sharing banter offline best. Pop in and introduce yourself. Let us know what you think of our just-out-of-the-oven website too. We want to make it as useful as possible - a place to share some baking tips, for you to get to know a bit more about us and our suppliers, and most important of all where you can discover what goes into our loaves. What exactly is ancient cereal or sourdough? What are the benefits of low GI? What will keep a growing school child, a farmer or a walker satisfied all day? 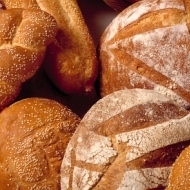 How about healthy breads for the dieter?! The answers are on their way! Oh yes, and did you know we also set up stall at some of Herefordshire, Worcestershire and Wales's best festivals and country shows? We'll let you know about them too.